ONEcount and Cambey & West have announced a strategic integration partnership, giving C&W fulfillment customers near real-time access to the ONEcount Identity-Based Advertising Platform. The integration allows ONEcount to identify, track and target web site visitors using the most up-to-date information in C&W’s circulation databases. Updates in ONEcount are seamlessly transferred into C&W’s system, allowing for a truly integrated user experience across all platforms. The bi-directional integration between the two systems gives publishing and association media customers a powerful toolkit that no single fulfillment vendor currently offers. While similar in form and function to a traditional Data Management Platform (DMP), ONEcount enables publishers to segment audiences based on behavior and identity, creating sophisticated targeting rules for advertising, content and other offers. Traditional DMPs only use behavior-based tracking to identify potential audience segments but in today’s highly-competitive digital media-sphere, publishers said that is not enough. 80% of publishers say they can’t compete with Google or Facebook without better ad targeting technology, according to a 2015 Econsultancy Survey. “Google and Facebook are the masters of identity-driven advertising. ONEcount simply levels the playing field, putting the power back into the hands of publishers who can now leverage the true power of their audience data and act on audience relevantly,” Fulton said. He noted that ONEcount is the only identity-based platform available. Because each web visitor is matched against a real “known” identity, third-party data can be appended to that record to gain an even deeper understanding of each visitor. Gleaning this “deeper understanding” of audience—and creating a richer connection with them—naturally translates to more effective marketing programs, providing direction for new business, content strategy, print-to-digital shifts, retention and engagement and higher CPMs. “As our clients look to gain more business intelligence about their audiences, to learn not just who they are but what they do, we wanted to partner with a company with a proven track record for identifying and enriching known audience data,” said Diane Cuellar, Cambey & West President and CEO. “We have so much data; now ONEcount provides a sophisticated tool that our clients can easily employ to augment that data and target well-defined segments of their audiences,” she added. 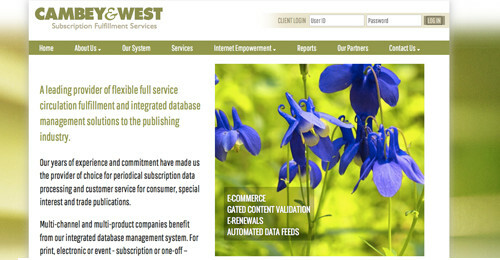 Cambey & West is a leading provider of subscription fulfillment and integrated database management services for the publishing industry. Its clients include B-to-B and consumer media companies with multi-platform products, as well as association publishers. As more publishers ramp up their digital presence, Cambey & West provides continual innovative technology solutions, often customizing these solutions to meet client-specific needs, including integrating with third parties for paywall access and data synchronization.